Or perhaps the lettuces and kales needed some fertilizer. Vegetables are generally heavy feeders, and leafy vegetables especially so. My garden doesn’t get fertilizer per se; the plants get all they need from compost. Years ago I calculated that a one inch depth of fully ripened compost could thoroughly satisfy the nutritional needs of vegetable plants — even intensively planted vegetables — for a year, and that’s what my plants get. As an added benefit, compost, in contrast to chemical fertilizers and even most organic fertilizers, offers a wide spectrum of nutrients in addition to just the big three: nitrogen, phosphorous, and potassium. For a quicker effect or where compost is not available, a concentrated organic fertilizer, such as soybean meal, might be in order. You might have guessed that soybean meal is high in nitrogen — 7 percent — since soybean seeds contain 40 percent protein and proteins are about 16 percent nitrogen. This entry was posted in Uncategorized and tagged alfalfa, compost, soybean meal. Bookmark the permalink. Trackbacks are closed, but you can post a comment. 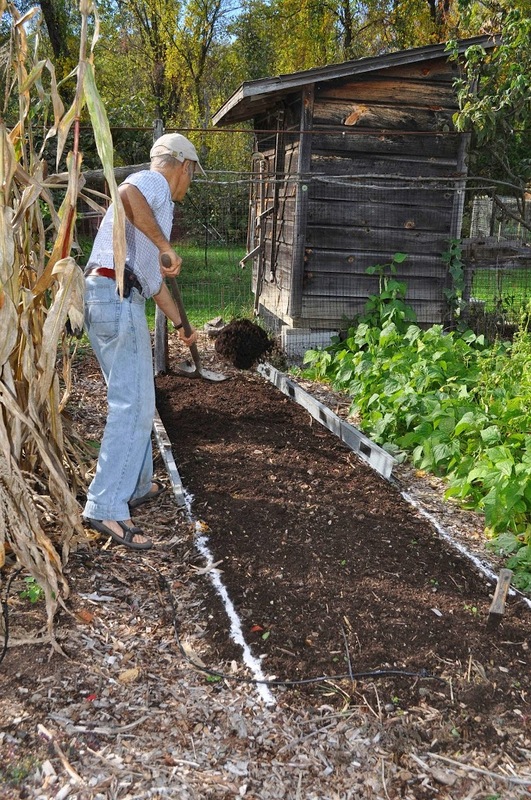 Have you thought about growing a few of rows of perennial alfalfa and harvesting it for your compost pile? Also a few rows of sterile comfrey which is an even better source of calcium and potassium than alfalfa. It’s also a good source of trace elements such as iron, copper, zinc, manganese, and boron. To be a good source of trace elements, the element has to be in the soil. Certain regions lack certain trace elements, in which case alfalfa or some other plant has nothing to pull in from the soil. Kelp, which is lightweight and rich in all nutrients, can provide any nutrients that might be lacking in a soil. Thanks for this clear picture about fertilizers! In this instance, why didn’t the drip irrigation (one of the 4 components of your weedless gardejning system) keep the transplants with a steady stream of moisture to dissolve the nutrients and prevent the yellowing of the leaves? Is it just a settings issue with the drip irrigation? I have heard you state that you set your drip irrigation to water in 5 minute intervals throughout the day for a total of 30 minutes per day. Surely, that should be enough to keep a steady stream of mositure to your transplants and allow among other things the proper dissolution of nutrients to the transplants? It seems to me that the vagueries of the weather and preciptation should largely be nullified by an automated irrigation system. The drip line in the bed with the sickly looking plants had, as I stated, inadvertently gotten detached, so those plants weren’t getting watered.